Arbor Day (or Arbour, from the Latin Arbor, meaning tree) is an annual observance in which individual or groups are encouraged to plant and care for trees. Arbor Day Tree Planting in the Philippines has been institutionalized in 2004 under Proclamation No. 643 to be observed every 25th of June throughout the nation.The said proclamation enjoined the active participation of all government agencies, private sector, schools and civil society group in tree planting activity. This year, approximately 60 employees and its family members participated in the annual celebration of Arbor Day Tree Planting, raising awareness about tree benefits and educating the young generation about the value of trees in our daily lives. Early morning blue skies and cool temperatures made Saturday, 27 June 2015 a perfect day to celebrate the Arbor Day inside the Japanese Garden Compound in Cavinti, Laguna. More than 1,500 seedlings of different species were provided to adults and children alike to plant and explore the mountainous scenery of the area. 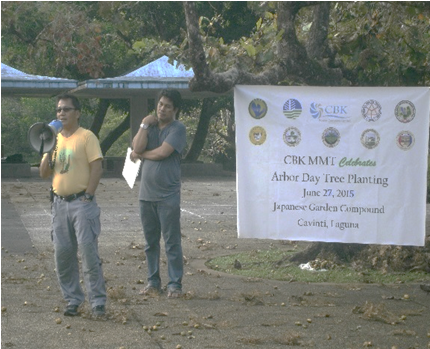 The seedlings were provided by the CBK Multi-Partite Monitoring Team (MMT) of DENR, CBK, NPC, LLDA and host LGU’s. One of the highlights of the celebration is the On-the Spot Poster Making Contest for children 12 years old and below. The contest let the children create an Arbor Day art with the vision about the importance of trees, environment, clean air, wildlife, clean water, etc. 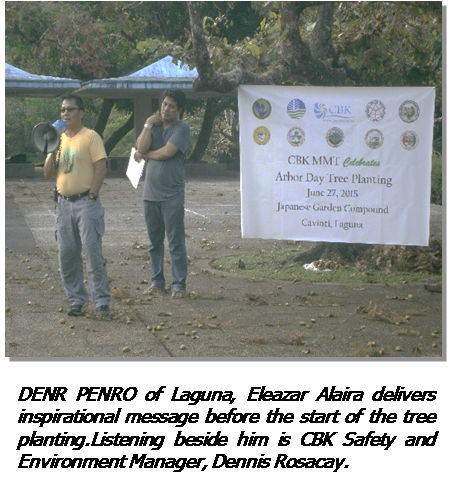 The annual celebration of Arbor Day Tree Planting was organized by the members of CBK MMT headed by the DENR’s Provincial Environment and Natural Resources Officer (PENRO) of Laguna, Mr. Eleazar S. Alaira and Safety and Environment Manager of CBK, Mr. Dennis A. Rosacay.